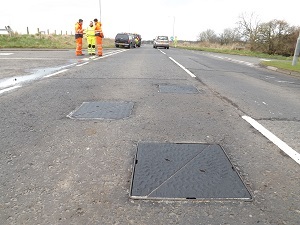 Safety was the main topic when Preformed Markings assisted leading specialist highways contractor EMTEK in Northern Ireland, to provide anti-slip solutions to the many manhole covers that stretch along the NW200 Motorcycle Road Race track. The race (as we know) which started in 1929, runs in a triangle between Coleraine, Portrush and Portstewart, with competitors racing against each other, at speeds in excess of 200mph. The race draws in over 200,000 spectators who line the 9 mile course. After investigating every probable solution to track safety, the organisers and utility companies agreed that Premark® Anti-Skid was the most economical solution, in terms of material, traffic management and driver disruption. Neil McKee, Managing Director at EMTEK, commented on the straight forward application process and the instant results provided by the material. 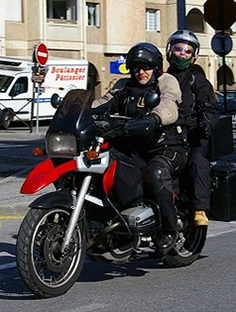 At Right To Ride we have carried information on Preformed Markings – Click Here – and we recently met up with their representative to discuss issues and solutions for “anti – skid” as regards to motorcycling.